The Federal University of Petroleum Resources Effurun, FUPRE Freshers Matriculation/Academic Gown Collection Guidelines for the 11th Matriculation Ceremony for 2017/2018 Academic Session. 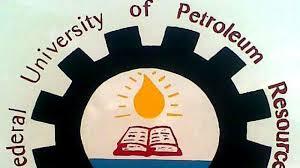 This is to inform all matriculating students of the Federal University of Petroleum Resources Effurun that they are required to collect Academic Gowns from the Academic Office with effect from Tuesday, 3rd April, 2018 between 12.00noon and 3.00p.m. on payment of the sum of Two Thousand Naira only (N2,000.00) to the University Account via www.remita.net. and presentation of receipt generated to the Academic Division. All academic gowns should be returned to the Academic Division immediately after the Matriculation Ceremony and not later than 9th April, 2018. Thereafter, late return of academic gowns will attract a penalty fee of One Thousand Naira (N1,000.00) for each additional day while the sum of Thirty Thousand (30,000) Naira will be charged for the replacement of any lost academic gown.